This spring me and a few friends are planning a Path to Glory campaign using the new rules for Age of Sigmar. They're a sort of homage to the old Realm of Chaos rules where one creates a chaos warband led by a champion and slugs it out in the chaos wastes. All done the old fashioned way using randomised tables and dice rolls! It's really quite fun and charmingly old school. I, unsurprisingly, am going for a warband with Nurgle as its patron. That way I could simply expand the small warband I started last year (plus it's my favourite god anyway). Alexander does a Slaaneshi warband and Erik AKA Nordic chose the Changer of Ways. He looks really brutal ! Nice job ! Really looking forward to this campaign of yours. Are you Alexander, and Nordic posting your progress somewhere to? We've all got threads in the ammobunkers fantasy section - plus I'll also be posting updates on all of our efforts here on the Convertorum. 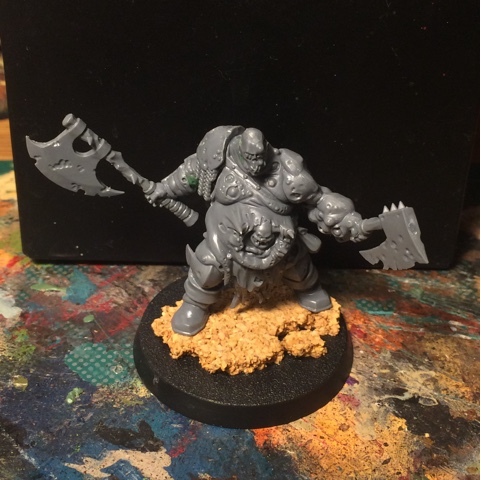 I have started building a nurgle warband as well, specifically because of the Path to Glory campaign system. I've been meaning to dabble in chaos for a while, but this was the final needed push. The putrid blightkings kit is absolutely beautiful, and I have plenty of extra parts to equip some of my chaos warriors to be nurgley. Then on top of that I am doing a Harbinger of Decay conversion, which is one of the blightking models mounted on top of a Dracoth, that is nurgled up. He will be Gagnus the Ratcatcher, on Gluttdragon. Cheers! Your plans sound great - let me know when you've built them! You bet. My main blog is where I put up my WIPs. I already have up a big conversion on the Lord-Celestant on Dracoth by making the Dracoth into a Dire Bear. Looking for your new models! I returned to the hobby some months ago after discovering your blog. Decided to go chaos & nurgle because as you know better than anyone, they are the best for converting and kitbashing (and because painting skulls and chaos armor is the closest thing to Zen I've ever known). 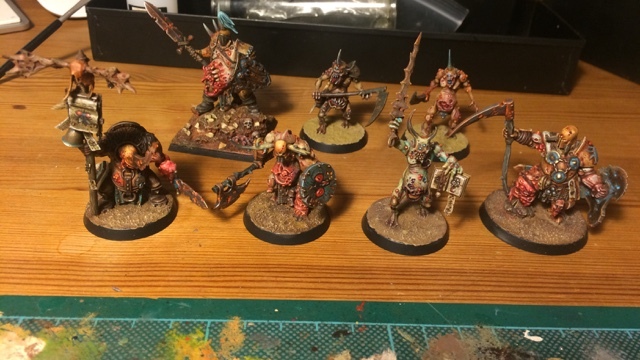 As a nurgle player, it's great to see you doing a warband similar to mine. I started converting my chaos ogres yesterday and left a box of river trolls waiting for some inspiration (a.k.a., do whatever Johan does). So, please keep us posted. Glad to be cited as a source of inspiration! I really dig your models - especially the scenic bases that turn some minis into small dioramas while avoiding crowding the main mini. Good show sir! "Alexander does a Slaaneshi warband and Erik AKA Nordic chose the Changer of Ways." Where can we see these warbands? Are you going to take group pics of all warbands? Yep. As of now they're both featured here on the Convertorum - plus both me, Erik and Alexander have plogs in the Ammobunkers fantasy section. Why using the newest rules? They are just parasiting the concept from Warhammer.